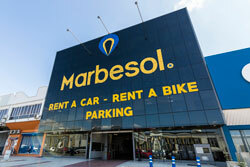 Enjoy the good weather of Malaga, without parking problems, programming routes with our bikes. We deliver and collect our motorcycles at the point of Malaga capital or Torremolinos that you indicate when making the reservation. Do not waste your time waiting for public transport and move around with total freedom. We also have bicycle rental so you can use the most environmentally friendly and environmentally friendly way. Malaga has a wide network of bike lanes so that you can move safely in our city.